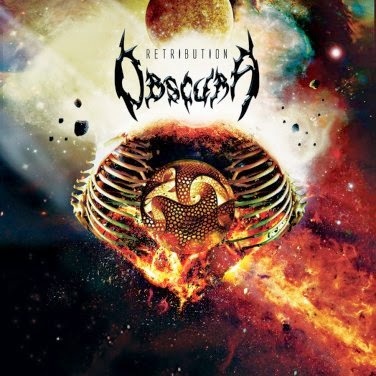 Though its successor Cosmogenesis is the sole Obscura record that I find myself repeatedly returning to, Retribution was a fairly interesting control group from which the band's more interesting ideas evolved, and it also possesses a fraction more raw intensity due to the less polished production values and wilder exhibition of those ideas...several were thrown out there to passing celestial bodies in the great expanse, and only a few stuck, but it was obvious from the beginning that these German exemplars might fill the void left behind by Necrophagist's indecision to continue producing and releasing material beyond their sophomore album Epitaph. So, hey, if Obscura, Cytotoxin and Centaurus-A have decided to shoulder the kraut tech death burden themselves, so be it...I like a lot of what I've heard from them, if not everything. Retribution is based in blasted brutality like a lot of other, cruder death metal of the last 15 years, but the difference here is that they drew upon the jazzier, progressive chord arrangements redolent of forebears like Death, Atheist and Pestilence in the early 90s. I'd liken it to Chuck Schuldiner having written a record for Brazil's Krisiun, or Morbid Angel going all cosmic with a more scientific, adventurous theme rather than that of grotesque eldritch horror (though Retribution is lyrically more personal than its followup). Perhaps a meatier-clad Mithras is also a viable comparison. At any rate, you'll recognize a lot of the techniques, in particular the drumming, but these are imbued with some more atmospheric phrasing, chugging and squealing reminiscent of commonplace US brutal death metal, and even some cleaner vocals to balance out the rather indistinct post-Chuck growls here that would probably flee my mind entirely if not for the contrast they create when sustained against the busier music. But lots of the chug riffs feel like those spidery Morbid Angel crawls of yesteryear, and though there are some calmer and more atmospheric passages dowsed in harmonies, a lot of the tremolo picked passages feel pretty bland with the blasting...I'm just glad they break these up often enough that Retribution doesn't grow totally dull. On both a technical and memorable level, the songwriting on the debut just doesn't match up with the second album, due to the fact that most of the more interesting riffing breaks just feel like leftovers from either Death's Human or Atheist's Unquestionable Presence, only beyond their more savage context with the more intense drumming, they really don't do anything special. Speaking of which, I found the mix of the kit a little hissy, especially the cymbals and hi-hats. Just not something I really enjoyed...he can blast or roll out the double bass with the best of 'em, but has no more character than a drum sequencer, and I wouldn't have been surprised to find out that was what they used here. I've even got the remastered version of this through Relapse with the better cover art, and it doesn't sound so hot. The cover tunes (Death, Suffocation and Morbid Angel) are probably a little too obvious to be interesting, but they at least showcase their ability to play at that level, just not to write at it with their originals. All told, this is an adequate but skippable debut which ekes out little more than the groundwork to launch its successor into the depths of the cosmos.